Chill cocktail glass. Stir all ingredients over ice. Strain into the glass and garnish with a lemon twist. What you have here is basically a Rob Roy zipped up with a little Benedictine and holding on the bitters. Most recipes I have found do forgo the bitters (the Benedictine contributes similar flavors). But a dash or so of orange or Angostura bitters could be interesting. Gary Regan thinks the Bobby Burns originated at the Waldorf-Astoria. We can't be sure but I'll defer to Mr. Regan. A few variations on the Bobby Burns kick around in the old cocktail books. One I need to try is in the Fine Art of Mixing Drinks. 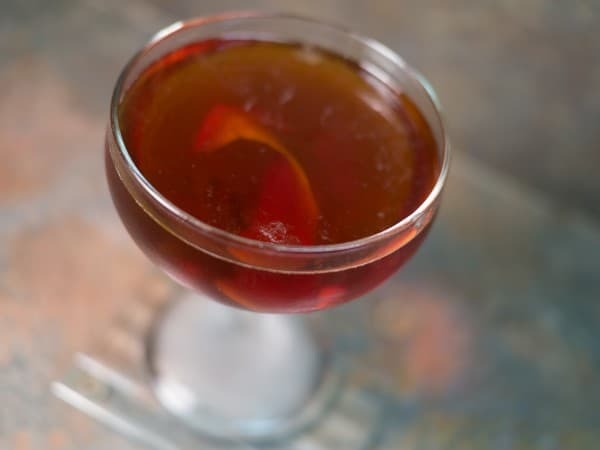 Here David Embury uses Drambuie instead of Benedictine as the modifier. As Drambuie is made from Scotch, this seems like a delicious idea. Pipe up in the comments if you've tried this variation.